- Kenneth Johnson, creator of V, discusses It Can’t Happen Here (1935). 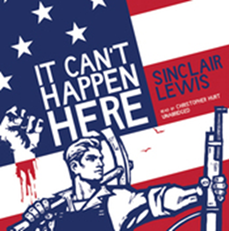 Sinclair Lewis (1885 – 1951) was the first American writer to win a Nobel Prize for Literature, and the novelist’s most famous work to this day is the aforementioned It Can’t Happen Here. The novel is set during the election season of 1935 – 1936, and focuses on a journalist named Doremus Jessup as he watches national events unfold in a terrifying way. Specifically, a Democratic candidate, Berzelius “Buzz” Windrip” secures the nomination for the presidency away from incumbent Commander-in-Chief FDR, and then defeats Republican candidate Walt Trowbridge in the general election to gain control of the nation in 1936. After Inauguration Day, folksy Buzz Windrip declares martial law, relegates the Supreme Court and Congress to advisory status, and unlooses his armed “Minute Men” militia -- originally an “innocent” marching club -- upon the country. American citizens who protest this turn of events are sent to concentration or labor camps while Windrip scapegoats Jews, blacks and women for the nation’s troubles. Soon, President Windrip and his PR advisor/deputy/minister-of-propaganda Lee Sarason abolish the names of the states and partition America into administrative provinces for easier management. The Republican and Democratic Parties are outlawed, and one party replaces them: The American Corporate State and Patriotic Party. Watching America succumb quickly to fascism, Doremus joins up with the N.U (New Underground), which helps beleaguered American citizens escape to Canada. In the end, the tyrant Windrip is run out of office, but Sarason first, and then another dictator follow in his footsteps. 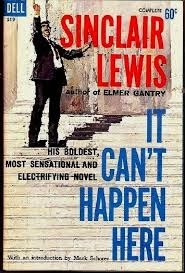 A good starting place in any discussion of this Sinclair Lewis novel is the title. 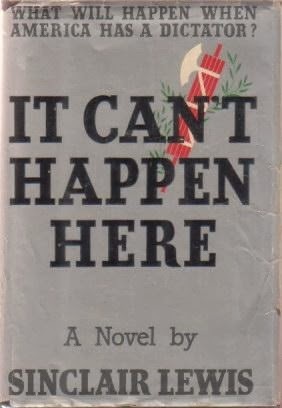 “It Can’t Happen Here” is the resounding belief and refrain of many Americans in the book, who just don’t believe something as European -- and therefore alien -- as fascism can take hold in the United States. They watched as Mussolini and Hitler rose in distant lands, but because of language and cultural differences simply couldn’t see such men assuming power in Washington D.C.
One of the key conceits of It Can’t Happen Here is that American fascism -- while still fascism -- will be cloaked in different trappings. If it rises here, according to Lewis, it will do so draped in militant Christianity and fronted by a candidate with a “folksy” manner. The dictator in the book, Buzz Windrip, for instance, likes to claim his birthdate is December 25, the day celebrating Christ’s birth. In addition to his proclamations about his pious religious nature, Windrup relies on homespun wisdom and colloquial speech to meaningfully connect with the “masses” suffering in the Great Depression. “I try to make my speech as simple and direct as those of the Child Jesus talking to the Doctors in the Temples,” he declares at one point, again comparing himself directly to Christ. Windrip’s appearance and attire are similarly deceptive in their home-spun nature. At one point, the author even compares Windrip’s style to Mark Twain. In this way, the reader sees that homegrown fascism would look very different from the model across the world. Windrip’s characteristics purposefully align him with the less-educated “common men” who support him. Like them, he has a disregard for learning and flaunts a no-nothing attitude. To describe the character another way: Windrip’s approach is populist. And when he seeks power, accordingly, Windrip does so for his brothers, not for himself…or so he says. Windrip assumes control of the White House in 1937 according to It Can’t Happen Here, and after establishing fifteen policy goals, which Sinclair Lewis enunciates in great detail and which conform to our understanding of fascism that I wrote about the other day. Among these policies is the creation of a Central Bank -- to be administrated by a Board appointed directly by the President. Also, Windrip seeks the establishment of a commission to determine which labor unions are “qualified” to represent workers… again answerable to the President. Both these policies are crucial ones vis-à-vis fascism: the centralization of authority or power in one person. Very significantly, Windrip’s platform demands the absolute freedom of religious worship, and a maximum wage. It is this latter promise that the wages of millionaires will be capped and that veterans will receive a stipend -- wealth distribution, essentially -- that carries Windrip to the Oval Office in Lewis’s text. Furthermore, Windrip’s platform targets certain demographics. Women, for instance, may work as nurses or in other “feminine” settings such as “beauty parlors,” but otherwise must return to the home to raise children. As I noted the other day, women are not valued in a fascist state, except as they can give birth to more loyal and strong soldiers. African-Americans, meanwhile, are to be prohibited from “voting, holding public office, practicing law, medicine, or teaching any class above the grade of grammar school.” And they are to be taxed 100% of all income in excess of 10,000 dollars per family a year. Here, we see that a fascist philosophy believes it is appropriate to limit the right to vote to certain groups of people, so as to hold on to power. As mentioned above, absolute freedom of religious worship is protected in Windrip’s platform, but there’s a caveat. No atheist, Jew, or “believer in Black Magic” shall be able to hold office until first swearing allegiance to the New Testament. In other words, you have to be a Christian to enjoy absolute religious freedom in Windrip’s America. Furthermore, any socialist, communist or anarchist is to be tried for high treason. The minimum penalty upon conviction is 20 years in a labor camp, and the maximum penalty is death by hanging, or whatever method the judge in the case happens to find convenient. In terms of the other branches of government, Congress will serve only in a n advisory capacity and The Supreme Court shall have “removed from its jurisdiction” the power to rule the president’s actions unconstitutional, according to Windrip’s plan. After Windrip takes the oath of office in It Can’t Happen Here, he establishes a new cabinet position: Secretary of Education and Public Relations. In other words, this is the propaganda division of the re-formed U.S. government. The Minute Men are issued machine guns, rifles, bayonets and other weapons. This is the new reality, of President Windrip’s America. Lewis writes: “There was a certain discontentment among people who had once owned motorcars and bathrooms and eaten meat twice daily, at having to walk ten or twenty miles a day, bathe once a week, along with fifty others, in a long trough, get meat only twice a week…and sleep in bunks, a hundred in a room.” (page 188). FDR is one real-life historical figure featured in It Can’t Happen Here. He loses in a primary his bid for a second term because he can’t end the Depression quickly enough for the taste of many suffering citizens. What Lewis hints at, then, is that fascism is a philosophy that hinges on emotions such as anger and resentment, and which isn’t, ultimately, susceptible to reason. Again, we see this concept played out in V. Citizens become angry at “scientists” for their behavior towards the supposedly benevolent Visitors. “The Chief” -- Windrip himself -- is (very…) loosely based on Huey Long (1893 -1935), the Democratic governor of Louisiana from 1928 – 1932 and a U.S. Senator from 1932 - 1935. In fact, Long had planned to challenge Roosevelt for the presidency in 1936, but was assassinated in 1935. His platform called “Share the Wealth” featured elements of Windrip’s “maximum wage” plank. Secondly, It Can’t Happen Here suggests that fascism comes to a nation when the people are suffering and poor, and looking to blame someone for their situation. In such a context, a strong-man who promises quick remedy, and does so with apparent “common sense,” “earthy” humor, and religious piety is difficult to resist. 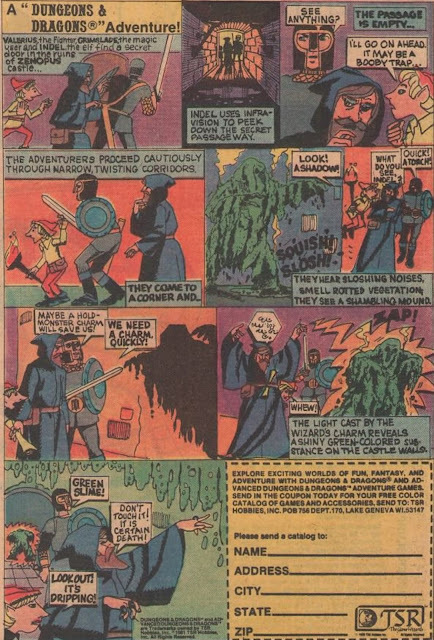 The Visitors arrive and their “Chief” -- The Supreme Commander, John -- promises peace, stability, friendship, and new technological and medical wonders that will revolutionize human life. At first that’s all anybody sees, just as in It Can’t Happen Here, good citizens don’t recognize Windrip’s power grab for what it is…an end to freedom. “V” is for victory, but it is also, I would say, for vigilance. In a sense, that’s what Sinclair Lewis’s story is all about. It Can’t Happen Here is cautionary tale about what a lack of vigilance could bring to America if people get very angry, and tempers run irrationally hot. Next up in The Visitors are Coming: "To Serve Man" (tomorrow afternoon), and Shadow on the Land (1968), on Monday afternoon. It would take entirely too long to point out any commonality between this novel and US politics of the past decade. But I'll also reference Jack Webb's Red Nightmare, which supposes Communism, rather than Fascism. But the oppression is the same, whatever the name. I agree that oppression -- from either end of the political spectrum -- is oppression. Like you, I also refrained from discussing in detail modern politics here so as not to alienate anyone who might find value in the book. I don't think it is necessarily helpful to look at modern politicians and shout "Fascist" with a finger-point. Both sides could do that, and I don't think it gets us anywhere. Instead, I merely try to adequately detail Sinclair Lewis's book and the ways that he sees "fascism" (largely right-wing) coming to America. You are right, if it were Communism, it would be from the other end of the spectrum, and likely just as bad. I'm not picking sides...just reviewing a book. I report...you decide. Or something like that. Interesting review. 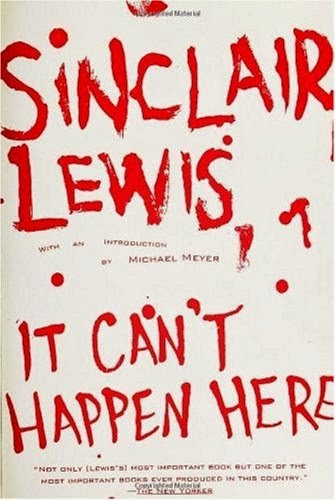 I had a friend sometime back, who told me that Sinclair Lewis was his favorite author, which took me a bit aback (going for a less well known, older author, rather than pop-author-of-the-day). He always was well read. I don't remember him saying anything about this particular book, but I'll have to ask him the next time we speak. Actually glad you left politics out of it because as you said, you can finger point on either side, and after all it's a work of fiction as much as Orwell's 1984 or any other. One of the things I do wish for though is that there could be a more civil means for political discussions. Politics for me has become akin to my old labor union and the other unions within that field--sort of necessary, yet a bit antiquated. They created an atmosphere of finger pointing (smoke screen) at the other labor unions saying everything was their fault, which just upset the average worker, who would also mimic their charges at times, all the while getting stuck in the middle. It's complex, and not easily solved. I noticed you deliberately maintained a focus on content here. I certainly enjoy your perspectives even if I disagree John. I guess Sinclair never imagined it could happen in this way. But again these things are a matter of perspective and I'm certainly happy to discuss it with civility. And I could go on. You wrote that I deliberately maintained a focus on content here. That's exactly what I did, because I didn't want a discussion to devolve into liberals vs. conservatives or democrats vs. republicans. It's too easy to fall back into teams and not discuss the issues meaningfully. Also, I was afraid I would get all of these comments saying things like "Bush is a fascist" or "Obama is a fascist." I hope that by spelling out in detail EXACTLY what the dictator in this book does, people would see that we don't have a fascist state here, at least not yet. Neither Bush nor Obama have put us in labor camps. Neither Bush nor Obama have dissolved Congress. Neither one has de-fanged The Supreme Court. Neither one has outlawed voting among certain demographics. It's true, that there are troubling signs -- like Bush's initiation of NSA spying and Obama's expansion of it -- but there are ALWAYS troubling signs. The point is, as I write in the review, not to be hysterical or finger-pointing about this subject, but just to be vigilant. To pay attention. People must be holding back. No one of any political stripe or belief system is immune and anyone can become a scapegoat. Christian, Jew, black, white, male, female, ANYONE. Just remember: those who do not learn from the past are condemned to repeat it. Duanne: Well said, my friend. The tide can turn very quickly, and any demographic can be scapegoated if there is enough anger lurking beneath the surface. Your warning about remembering the past is crucial, and significant. We must remember, but I think we must be rational.